“We’re gonna have a sixteen-hour layover in Singapore,” I told C as I was sorting out our Scoot flight from Manila to Australia. “Is that okay with you? 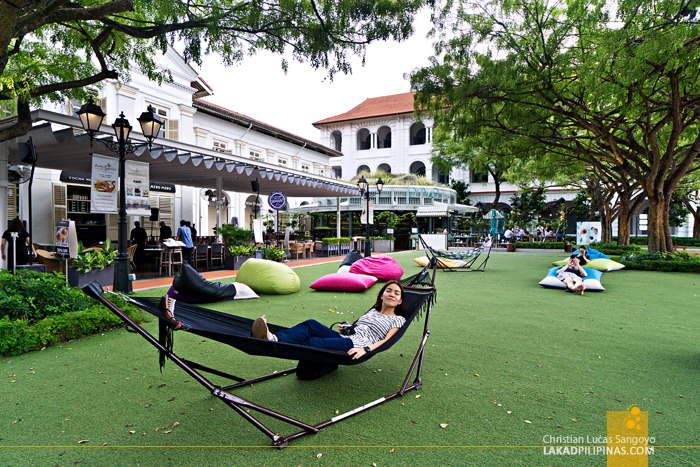 What can we do in Singapore for sixteen hours?” I asked her. “Eat!” was her one-word reply. It was past nine when we arrived at Singapore’s Changi Airport. We’re taking it slow—browsing at the cameras shops, looking for Starbucks mugs, and checking out Lego prices—we’re not in a hurry, after all, we still have more than enough time to go to the city, eat our favorite dishes, and walk around a bit before going back for our Scoot Singapore to Sydney flight which was still at one in the morning. Going to the city was easy enough, we still have our MRT cards from our previous trips—valid for five years of use—so we just topped up and boarded the train to Tanah Merah, then transferred to another one going to Bugis Station. 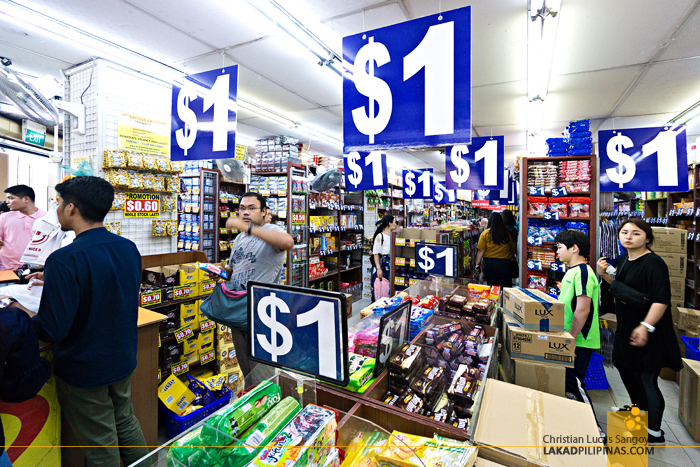 Bugis Street [GPS MAP] is famous for cheap shopping, but we’re really not here for a shopping spree—well, okay, we did check out the One Dollar Store for chocolate pasalubong (lol, our trip hasn’t even really started yet). From the station, we traced our way to the Albert Centre hawker area [GPS MAP] which was then brimming with the lunch crowd. 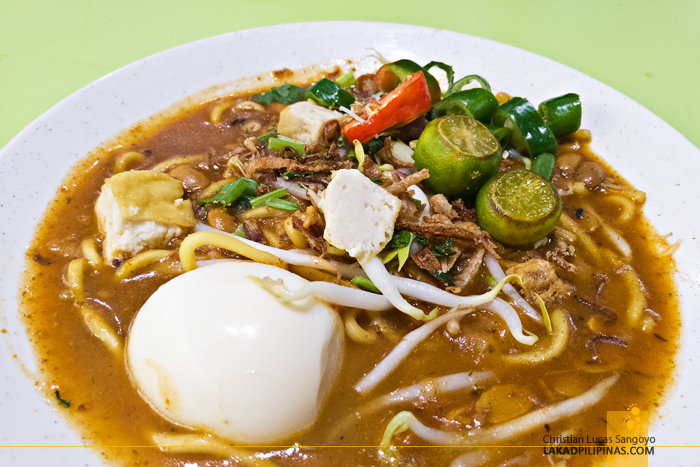 C went straight to her favorite stall selling yong tau foo laksa (SGD6.00), while I looked for a bowl of mee rebus (SGD4.50), my new favorite Singaporean dish. Half an hour later, fully satiated and sweating profusely from all that hot soup, we thought of what to do next. I raised my hand. Cameras! We proceeded to the nearby Sim Lim Square [GPS MAP] to look for cheap camera filters and bags. This was where I bought my second Sony A6000 body for a really cheap price at Alan Photo a few months ago—even cheaper than at Manila’s camera haven, Hidalgo. C was looking for a bag, and I also (secretly, haha) wanted to buy one. Unfortunately we didn’t find any to our liking. 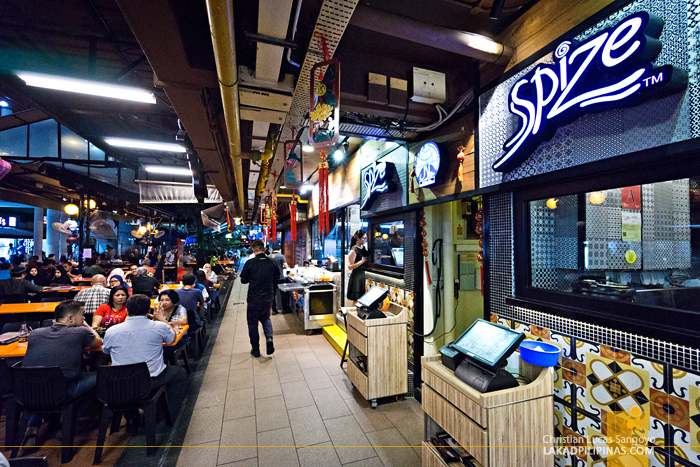 With nowhere else to go, we turned to our friend, R who’s working in Singapore, for where to go next. We really didn’t have any plans so we were quite excited when he suggested we go to CHIJMES (pronounced as chimes). It sounded new to us. 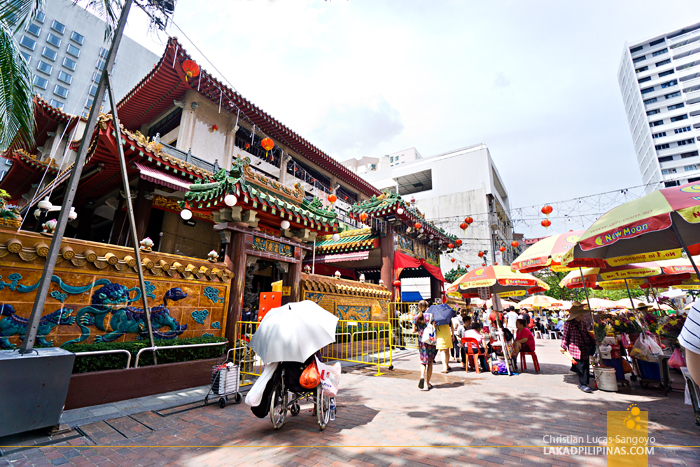 Following our mobile map, we wended our way through the market vendors of Waterloo Street, passing Kwan Im Thong Hood Cho Temple [GPS MAP], a traditional Buddhist temple built in 1884, in the process. Singapore’s really hot at this time of the year and feeling the heat sinking to our very soul, we stopped by another hawker center, Chang Cheng Mee Wah Coffee Shop [GPS MAP], for a round of kopi ais (SGD1.20). 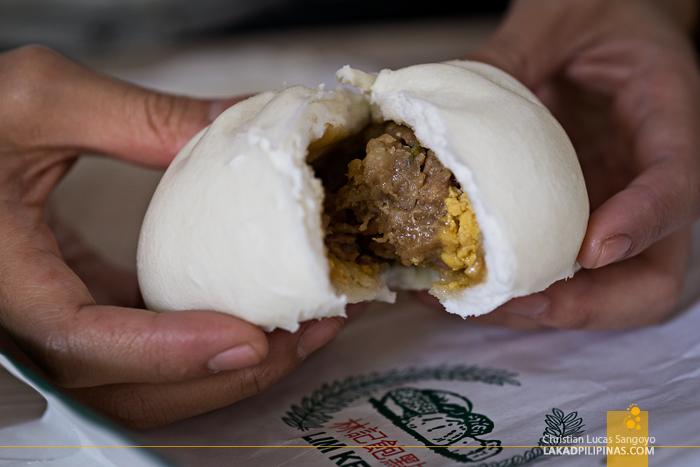 I sneaked in a delicious bun of big bao (SGD1.60) while we’re at it. 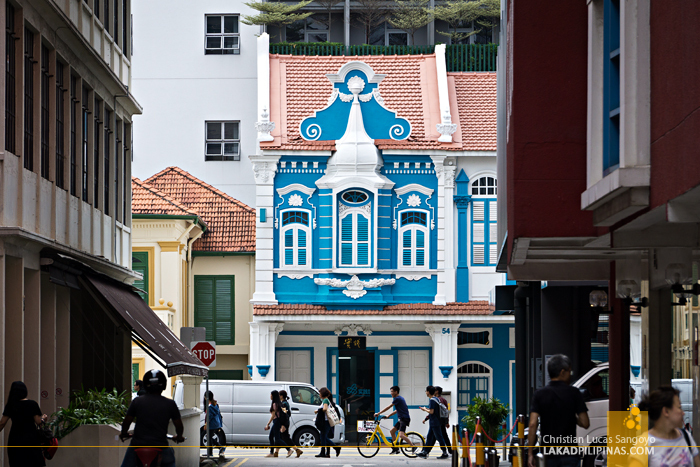 CHIJMES was only a few blocks away from where we were and walking along Queen Street, we saw how the neighborhood was changing as we got closer—the architecture started to turn more artsy and classical, with white paint dominating the buildings. I just realized we’re almost at the National Gallery of Singapore which we visited a year back. 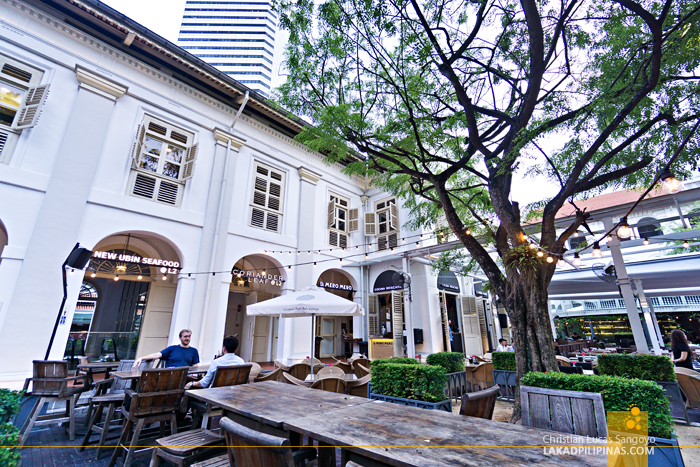 We took a quick look at the Singapore Art Center (SAM) [GPS MAP], admiring its neo-classical façade and having a few photo ops along its outdoor arcade before crossing the street and entering the Cathedral of the Good Shepherd Convent [GPS MAP]. 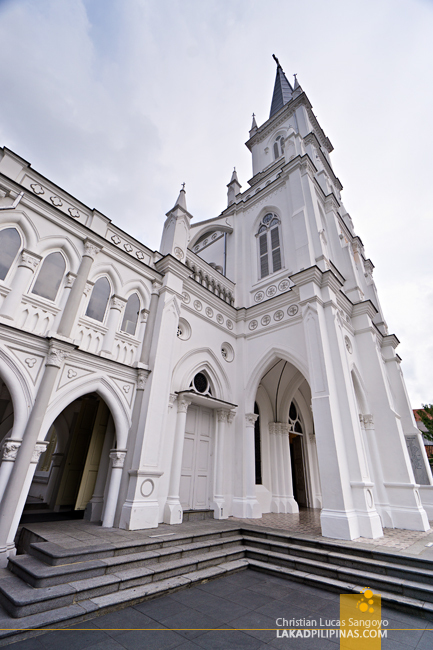 The complex itself, built in 1847, is the oldest Roman Catholic Church in the whole of Singapore. 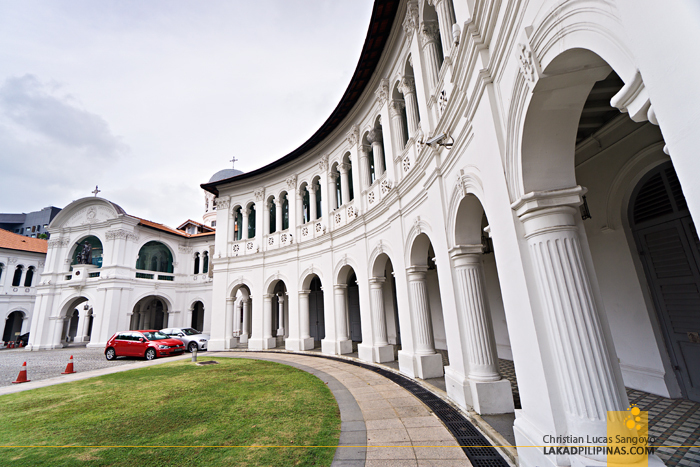 Across the street from it is CHIJMES [GPS MAP], an acronym for Convent of the Holy Infant Jesus Middle Education School. 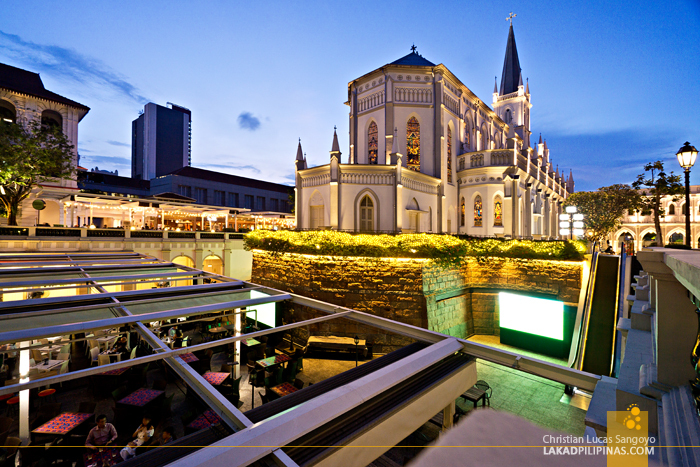 Originally a catholic convent founded in 1852, it has undergone numerous transformations, from a school, to an orphanage, and now, an entertainment compound complete with restaurants, bars, and events place. 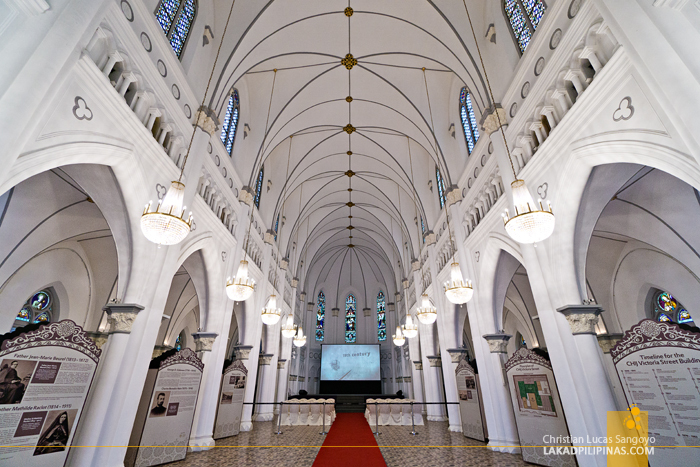 Its focal point is the Chijmes Hall, an intricate gothic chapel which was completed in 1904. The place, a complex of courtyards, gardens, cloisters, and covered walkways, is really gorgeous. And I really mean it. It’s a good example of how heritage architecture can be converted into modern space without losing its soul. Its transformation hasn’t gone unnoticed. 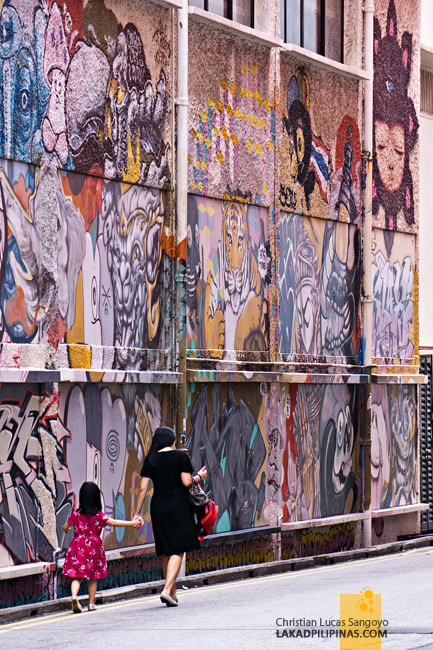 It was given a status as one of Singapore’s National Monuments, and in 2002, was given a Merit award in the UNESCO Asia Pacific Heritage Awards for Cultural Heritage Conservation. Maybe a World Heritage tag wouldn’t be long in coming too. A garden area with faux grass and covered by large trees sits at the back of the chapel. On it are several bean bags and hammocks. Without proper sleep since leaving Manila several hours ago, we dragged a couple of the largest bags under a tree, wrapped our camera bags around our body and promptly dozed off. It was a deep and peaceful sleep, waking after an hour totally refreshed! We then met with R, who just came from work, and he herded us to one of his favorite restaurants in Singapore serving Malay cuisine. We took the MRT to Tanah Merah—which was perfect since it’s just three stations away from Changi Airport—then boarded a two-stop bus to the Bedok Shopping Complex [GPS MAP]. The food was quickly served and everything was absolutely superb! The serving size was so huge, we took the opportunity to have the leftovers as take-aways (we ate those as we arrived in Sydney where food is really expensive, lol). 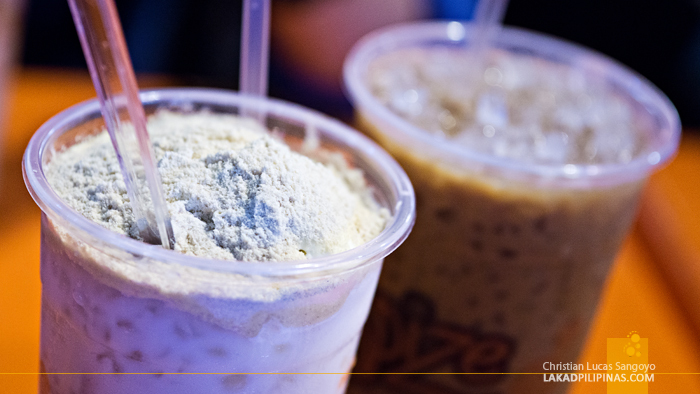 ICED HORLICK GODZILLA IS THE BOMB! For a moment there, I was transported back to Malaysia. 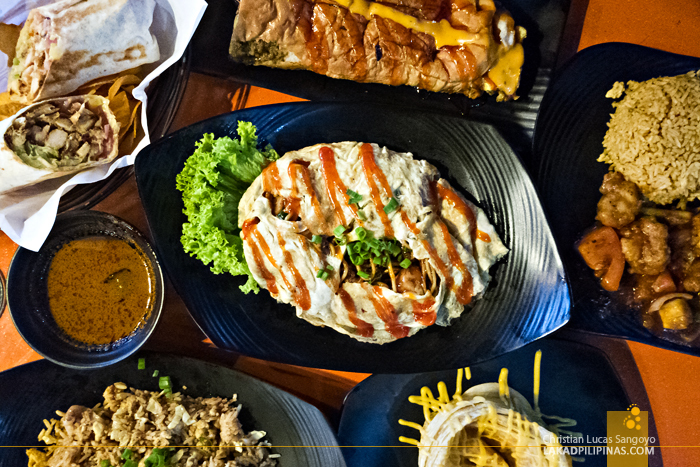 The whole feel of the place and the flavors of the dishes confused my head as to where I actually was. I felt as if I was having a food trip in Melaka. You’re in Singapore, Christian, I kept reminding myself. Well-rested and walking with full tummies, we bade farewell to our friend and to Singapore as well. Now, it’s time to see Australia! ~ OUR TRIP WAS MADE POSSIBLE WITH SCOOT. VIEWS AND OPINIONS, ALL MINE.